Thai Basil Turkey…..Light, Full Flavored, Fast. No matter what your cooking level is, I believe that everyone has 1 or 2 dishes in your arsenal that can be whipped out at any time and WOW any crowd. Lucky for me, one of my go-to dishes is light and flavorful…..and can be made in 20 minutes. Yup, I said it. 20 minutes. Introducing my coveted Thai Basil Turkey. Many everyday South East Asian dishes can be prepared very quickly. The combination of having your mis en place ready with the use of high heat truly expedites the process—resulting in flavorful and quick meals. This dish can be enjoyed with rice or if you’re looking for an even lighter (or low carb) alternative, use it in lettuce wraps. Serve them in endive leaves and they will be a great appetizer, too! In the photo shown, I used a large romaine lettuce since I had it on hand but I’d suggest using a Butter Lettuce as those leaves have a more natural “cup-like” curvature. Hope you give this delicious and quick dish a try! In a wok or large pan, heat oil over medium heat. Add garlic and cook until fragrant but not browned, about 1-2 minutes. Add Chilies and cook for 1 minute. Add Green Onions and cook for an additional minute. Add Ground Turkey. Using a wooden spoon or rubber spoonula, stir the turkey around the pan while breaking it apart to a crumbled consistency. Cook turkey until it is no long pink, approximately 5 minutes. Remove pan from heat. 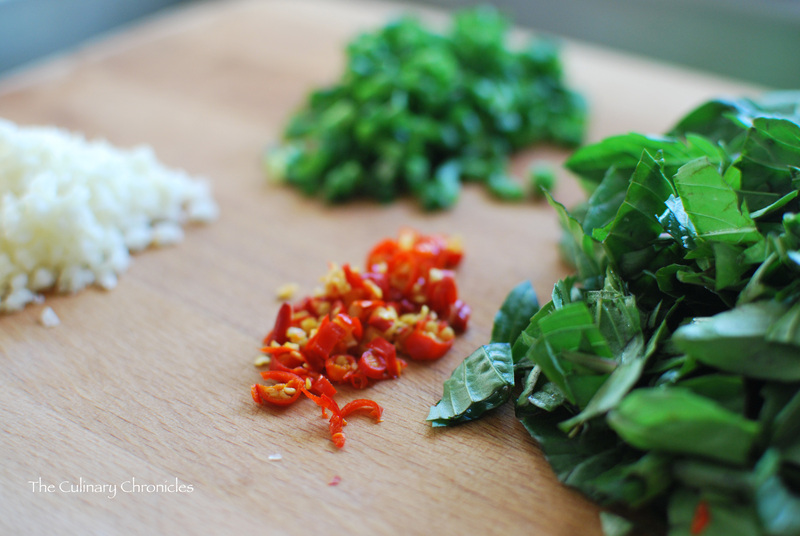 Add pepper, Nước mắm, and Thai Basil. Check seasonings and adjust to desired flavor. 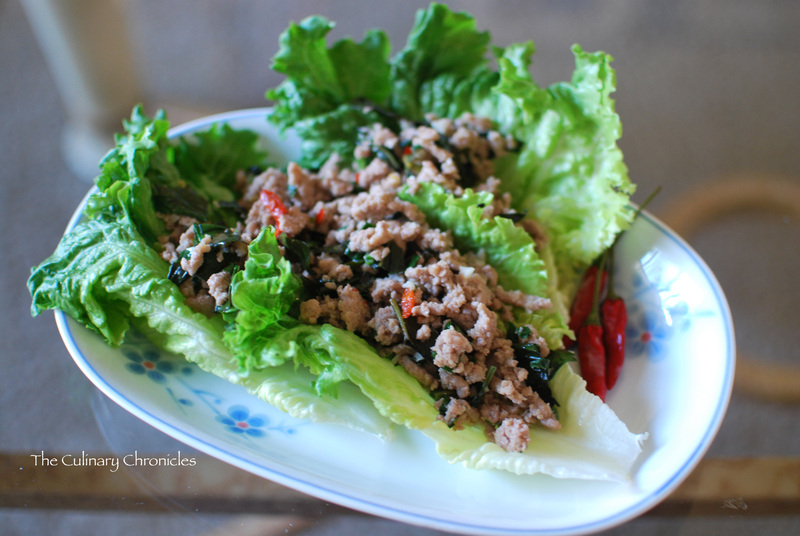 Serve with rice or with large lettuce leaves to wrap. NOTE: I like A LOT of spice in my dishes and tend to use even more than 6 chilies. However, if you are unsure about the spice level, just try 1-2 to start off with. This recipe was absolutely delicious! I made it the other day on a super-hot day and it was refreshing and just what I needed. I love lettuce wraps and this was a great twist on the same ones I make all the time. I love the Thai style of it – I actually added a little extra ingredient to it. For a sauce to drizzle over or dip in, I used Tasty Bite’s Pad Thai simmer sauce. It doesn’t require any cooking and is perfectly vegetarians and gluten free, so it served as a perfect complement to the wraps. I definitely recommend trying this as well as checking out the rest that Tasty Bite has to offer. Otherwise, thanks for the great recipe idea and bon appetit!